Groups are used to organize media and members into flexible, customized containers. They are searchable, support custom meta-data and can be manually ordered and nested. Media and members (users) can be placed in any number of groups. If your project is pre-moderated, you will need to approve groups before they can be made visible on the front end for users to upload into. Approve groups simply by clicking the green checkmark in the "Moderation" column. Similar to channels and collections, groups can be used to filter results from web services such as media.getFiles. 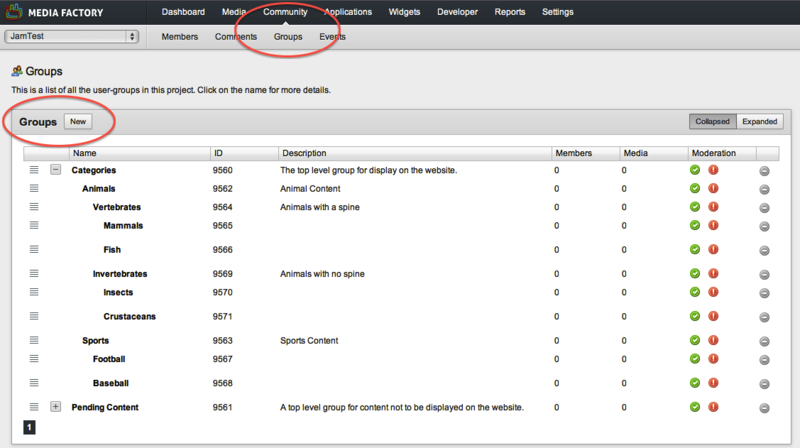 However, you can also retrieve a list of users filtered by group using users.getUsers for example. Finally, you can manage groups programmatically using the groups API methods. Click "New" and fill out the required Name, Description, and Parent Group fields. When you're all set, hit "create"
The About Tab (pictured above) is the default group page where you can find general information associated with your group. It includes the unique group ID#, name, description, creation date, parent group settings for taxonomy purposes, start and end times for group availability, and Brightcove publisher ID field. The Logo tab is where you will go to choose a group logo. You can upload a new file, or reference an existing media item using its unique ID#. Enter a street address to pre-populate the Geo-location tab and map. Other location details are used for internal purposes, but can be displayed on the front end using our API's. Configure email uploads into this group via the Email tab. See this article to learn more about setting up email uploads. You can also configure email alerts to any group members, notifying them when new media is added to the group. This is a great feature for those whose moderators are assigned to certain groups. Input an address or geographical location to drop a pin on your group map. Choosing a location will set the default map centre. These are custom meta data fields to be used in application templates. They should only be set once you have discussed this feature with your Project Manager. Be the first to comment on Groups.